There are many DIY-types who have no shop workbench and need to find the best workbench to serve their occasional needs in the garage, home, or yard. Even handymen who have fully-equipped workshops often have the need for a good portable workbench to transport and set up on location or simply use as a cutting table. In recent years, many manufacturers have branched out from the folding plastic sawhorse concept to get into the folding workbench game. A space once dominated by the Black and Decker Workmate line is now crowded with options, and it is easy to get into a portable workbench at a budget-friendly price point. What makes the best portable workbench? A good portable workbench needs to be light enough to carry, ideally with one hand. It also has to be easy to fold and unfold, but at the same time, rigid and strong. The best portable workbenches will have features that make the job go quicker and easier, and they will be versatile to handle a variety of situations and functions. Finally, a good folding workbench is compact and stores out of the way in between jobs. Once you begin looking, the number of portable workbenches that are strong and durable enough to handle real work on a long-term basis dwindles rather quickly. We put quite a few through the test and came up with a list of candidates the might deserve a place in your shop. Take a look and see what you think. The Kreg Mobile Project Center is a very well-thought out workbench system that is suitable for the professional user but priced at a level that is friendly to the home DIY enthusiast. We were really impressed with the many functions and capabilities of this workbench, and it also has the heavy steel frame that we like to see. The bench weighs in at 40lbs. and has a built-in carry handle that makes one-handed transport fairly easy when it is folded up. Unfolded, the bench provides a 27-1/2 by 31-1/2 inch work surface that supports 350lbs. The surface offers many openings and both vertical and horizontal clamping options as well as a convenient lower storage shelf. Quick-release support arms let the two sides of the bench top fold down to allow for use as a traditional saw horse, and a 2x4 can be mounted to the top if desired. The real utility of this bench comes from the various clamping options as well as the accessory clamps and fittings that Kreg offers. Side brackets hold 2x4s, allowing you to create a large table out of 2 benches. Benches can also be joined side-by-side to one another through the use of clips that fit in slots on the edge of the bench. A slot down the center of the table top allows a clamp to be attached for horizontal clamping. A large variety of clamps, dogs , jigs, saw mounts and other accessories are available for use with the Kreg bench. This is a great work bench at a value price point, and with two of these benches, two 2x4s, and a piece of plywood you can set up a variety of work surfaces to meet the demands of any project. The Kreg Project Center comes with a bench clamp and several other accessories that are quite valuable in themselves. We recommend the Kreg Mobile Project Center as the best portable workbench on the market. You can watch the details video review. This video created by our friend The Poplar Shop. As its name implies, the Rockwell JawHorse is the animal among the portable workbench crowd. This 43lb.beast is made from solid steel and can clamp onto a full sheet of plywood with enough force that you need to be careful not to break the edges of the sheet. Anyone who has cut plywood on the jobsite knows the difficulty of propping the sheet up so the cut can be made freely without running the saw blade into the ground. It either took getting on your knees, a lot of maneuvering on sawhorses, or was a two-man job before the Sheetmaster came on the scene. The JawHorse can hold light stock easily and comes with a jig used to set up a 2x4 support to hold the wood stable if you are going to be cutting a lot of heavy sheets. Simple in design, the JawHorse is basically a tripod sawhorse with a big vise on one end. It is very stable when set up properly. Wheels provide mobility when the JawHorse is folded, with the third leg serving as a pull handle. The vice is foot operated, which makes it easy to handle and position the material being clamped. For simple jobs like clamping dimensional lumber or pipe for cutting, the JawHorse is like having a bench vise on hand. The JawHorse can also be used as a machine press to straighten bent material with up to 1 ton of pressure. You can also mount a table saw or chop saw on a piece of plywood and clamp it in the JawHorse to make a cutting station. The JawHorse is the kind of awesome machine that we find hard to resist. It may seem like a one-trick pony, but there are also a number of ways to set up a full-sized worktable based on the JawHorse, our favorite being to clamp something like a door into a pair of JawHorses. The clamping configurations are also broad, and the JawHorse is nearly as good as a second man on the jobsite. Whatever other portable workbench you might buy, you also need a JawHorse, so get one. 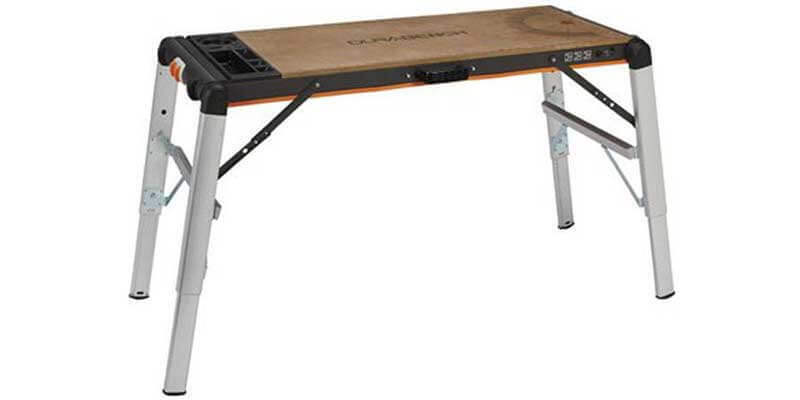 Black and Decker was one of the original manufacturers in the portable workbench space, and their experience shows in the Workmate 1000. It is their largest portable workbench, with a 28-3/8 by 17-9/16 inch bamboo work surface mounted on a heavy-gauge steel frame to sit 31-5/8 inches high. The frame construction has been the strong point of the Black and Decker Workmate in the past and that has not changed. The Workmate 1000 can support 550lbs. and is very rigid when set up properly. The bench has a solid overall feel to it, and work like hand-sawing or filing causes little wobble or shaking. The downside is that it is a relatively heavy workbench, weighing in at almost 40lbs. The Workmate 1000 is easy to fold and unfold, and a quick-release mechanism allows the bench be folded with one hand. The bench stands upright when folded, making for convenient storage. This bench is about 5” thick when folded so it can fit if you are working with a tight storage situation. The biggest issue we have with the Black and Decker Workmate is that its clamping mechanism is weak, with plastic crank handles and a flimsy plastic belt that drives the clamping action. The supplied plastic bench dogs that are supposed to assist clamping irregularly-shaped items do not fit in the pre-drilled holes well, and the holes are poorly positioned. All of that said, the strong bamboo top and sturdy heavy-duty frame make the Workmate 1000 very useful as a simple portable work table. The clamping function works well enough for light-duty use, and the pre-drilled table top offers various other options for clamping things down. We like to see solid steel construction and high weight-gearing capacity and if you feel the same way, the Workmate 1000 will be your best option. The X-Tra Hand 2-in-1 is a useful portable workbench that offers a large 50-1/2 by 18-3/4 inch work surface and several interesting features. Extendable legs change the bench from a 23-inch high step-stool to a 31-1/2 inch high work table. The bench weighs in at about 40lbs. and has a built-in carry handle. The 500lb. carrying capacity only applies to the step-stool mode, and it is not recommended to stand on the bench in the work table configuration. One side of the surface is webbed polypropylene decking while the other is a wooden work surface with protractor and ruler markings as well as drill-through holes and a V-groove for holding pipe while it is being cut. Some of the detail features this workbench offers are quite useful. We really like the built-in power strip that allows you to run one extension cord to the table then plug tools in to the side of the table. An accessory tray at one end of the workbench holds small parts and has a drill holster as well as a few tool slots. The ruler layout along one edge of the work surface comes in handy and the drill-through hole is generously sized. The X-Tra Hand is a useful work table but it lacks the versatility of some of the other benches. Clamping capabilities are limited and the wood work surface needs to be drilled out in order to use bench dogs. We also found this table to be a bit wobbly with the legs extended, and the button used to extend and retract the leg can become stuck inside the leg. On the other hand, the X-Tra Hand does make a handy elongated step-stool with a built-in power outlet. We would recommend the X-Tra Hand if your priority is to have a foldable large step-stool that can be a work table on occasion. The Worx Pegasus is a light-weight plastic workbench that weighs 30lbs. It has an aluminum-reinforced frame for extra stiffness and 31 by 25 inches of work table space. The Worx table tops fold down to convert the bench into a standard sawhorse. This workbench comes at a friendly enough price point that it is easy to pick up two and cover your sawhorse needs, and the tables can attach to each other to form an oversized work platform. The tabletop has slots for a squeeze clamp system and two clamps as well as 4 bench dogs are included. A light-duty storage shelf can hold tools, and the worktop has basins to control small items. The Pegasus is easy to setup and break down. It supports 300lbs. as a workbench and can handle up to 1000lbs. in sawhorse configuration. The clamps are stored on-board when the table is folded, and the whole unit is easy to carry under one arm. The ABS plastic used in the construction of this table is heavy enough to provide some rigidity and the overall impression is one of durability. The workbench folds flat down to 5” and has a smooth profile so it is easy to store. For a plastic-framed workbench, the Pegasus is surprisingly rigid and it appears durable. We like the squeeze clamp slot system, at least for light-duty gripping tasks. One thing we did not like is the fact that the worktop is not flat and true, so a router, chop saw, or other tool would probably need to be mounted on plywood then clamped to the table. The screw attachments for the table support arms are also small and light-duty. The Worx Pegasus would not be at home on a professional job site, but if you need a light bench that is easy to carry around the yard or throw in the car, or a good set of folding plastic sawhorses, it will do the job. The Keter Folding Work table is a relatively light folding bench built for the home shop and DIY market. The Keter work table offers a 33-1/2 by 21-3/4 inch work space with a secondary storage shelf and 400lbs. of weight capacity at a carrying weight of only 30lbs. The table has a snap quick-opening setup feature and closes just as quickly to a clean, smooth 4-1/2 inch thick form factor that can be stored on edge or hung by the large carrying handle. The legs of the bench are aluminum while the work surface, shelf, and brace are injection-molded heavy-duty polyethylene. Keter offers a similar model that features adjustable legs. The Keter work table has a variety of slots and drill holes as well as multiple options for clamping. The table comes with two squeeze clamps that slide into slots in the work surface to allow for horizontal clamping. Additional accessories and replacement parts are available. This is a light-duty work table that is suitable for those who want a light-weight, small bench for occasional use. We like the way it folds, and the included clamping system is a good idea. However, details like plastic closure latches and handle attachments along with somewhat spindly legs indicate that this bench cannot handle serious work. For small projects or as a portable craft table, this folding work table will be a fine choice at a very accessible price point. If you just need an extra pair of hands on the job to hold material being cut or drilled, the Performance Tool W54025 is a way to get into a clamping workbench for little more than a plain wooden sawhorse costs. At 13lbs. this bench does not weigh much more than any ordinary sawhorse, and it folds away into a compact package for storage. It offers a compact workspace with its 25 by 24 inch table top that features a 10” capacity clamp system operated by two hand cranks. Protractor and ruler markings on the top, four bench dogs, and a series of tool storage slots and holes in the cross braces complete the features offered by this bench. The Performance Tool bench is the bare-bones minimum, but it is very easily portable by just about anyone, and it is useful for working small pieces. It has 200lbs. of capacity, and when paired with a standard sawhorse, it gives you the holding help you need when doing circular saw cuts while working alone. Add some homemade jigs and dogs and this bench will let you take on a variety of tasks such as holding small boards for painting, working on bicycles, waxing skis, assembling furniture and kids’ toys, and anything else you can think of. If you are looking for a highly portable, easy-to-use workbench/clamp combination at a low price point, check out the Performance Tool W54025. It’s like an up-graded sawhorse and is perfect for jobs around the house. This little bench is goes minimal with a 22 by 4 inch work surface and a weight factor of only 9lbs. Super-portable, yet with an all-steel frame, this is the perfect craft or hobby workbench. Surprisingly for its light weight, the Goplus workbench is rated to support 220lbs. It stands 30” inches high and could be paired with a standard folding sawhorse. But where the Goplus excels is the light-duty, good value for the money space. It does everything a base model Workmate can do but costs less. The Goplus is easy to assemble, and at 36 by 22 by 6 inches folded, it can store anywhere. If you need a workbench that can stay in a car trunk or even travel with you by air, this is a good solution. And with a few modifications, for example, a small tabletop set up to clamp into the Goplus, you can greatly extend the capabilities of the bench. Included bench dogs and a good selection of drill holes makes it easy to hold odd-shaped items, and the clamp cranks turn easily with one hand. We wanted a super-light, value-priced workbench that would appeal to the light user or even the child hobbyist. The Goplus is perfect for seniors and others who do not want to handle a heavy item, and people who attend events such as craft, model aircraft, or sewing club meetings can throw this bench in the car in the blink of an eye. It’s a great little workbench at a price that is nearly impossible to beat. There you have it – a lineup of some of the best portable workbenches across the price spectrum. Of course, our favorites are the Kreg and the Rockwell JawHorse, replacing the old standby Workmate in our estimation. But the nice thing about modern portable workbenches is the ease with which you can find a bench to perfectly fit your user profile and the type of jobs you will be tackling most frequently. Think about the way you will use it most, then grab the best portable workbench for your DIY lifestyle.